Musical Movies, they’re like Disney for grown ups. There’s a romance, a happy ending and no dilemma can’t be solved with a song and dance. These fabulous movies have been smashing the box office and selling out cinemas across the world! Some for decades! Not to mention most have made it to Broadway and West End theatres! Some even began there. So come and have a taste of that Musical Movie magic and see why those stars always seem to have a twinkle in their eye. Your Musical Movie Dance class will begin with a super fun medley of dance party classics. Before we move onto your chosen movie dance routine. We’ll grab a cast photo, you know, for the billboard poster ;-) so be sure to run into hair and make-up, spray your hair, powder your face, apply some lips and add all the costume in your costume box. 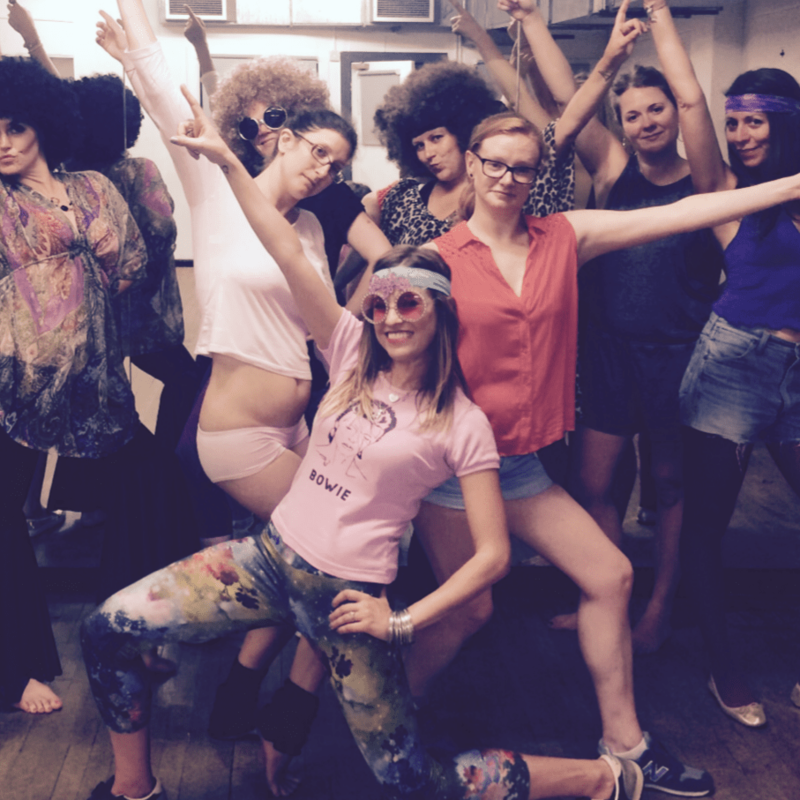 The wardrobe mistress (that’s us) has some extra ​​silver screen ​accessories ​that your Hen party can borrow too. If you need to show someone how you Burlesque, our long black sensual gloves will do the trick. 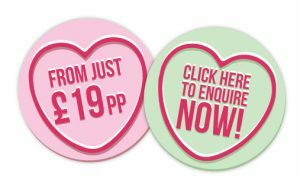 Or maybe our 80s face gems, to add that extra glitz and glam. Now your professional dance party teacher will take you through your chosen musical movie dance, learning some of the most iconic dance moves direct from the big screen. Don’t worry, we know that you’ll be a mixed ensemble of dance abilities, so we’ll move at a comfortable pace. By the end of your 60 or 90 minute musical movie party, you’ll be ready for camera! Don’t fret – there isn’t one, unless you want us to record you. But, we’d love you to keep on rehearsing and maybe stage your own show of what you’ve learnt, whether that’s on your big day, or just a night out. It’s worth mentioning one of our Musical Movie Dance Party teachers spiced up the WestEnd as Cha Cha in Grease​.​ But ​she ​also spiced up the Greek Island of Skopelos when she Dancing Queened in the box office smash hit Mamma Mia! Our ​​​Ballroom Boy ​played the role of Johnny Castle in Secret Cinema’s Dirty Dancing and his talent also earnt him the magical role as the ballroom-dancing Beast​ in Disney’s Beauty and The Beast 2017​! So which Musical Movie gives you the Oscar buzz? MUSICAL MOVIE MASH UP – if you want a totally high energy mega mix of some 80s classics, Flashdance, Dirty Dancing and Grease. 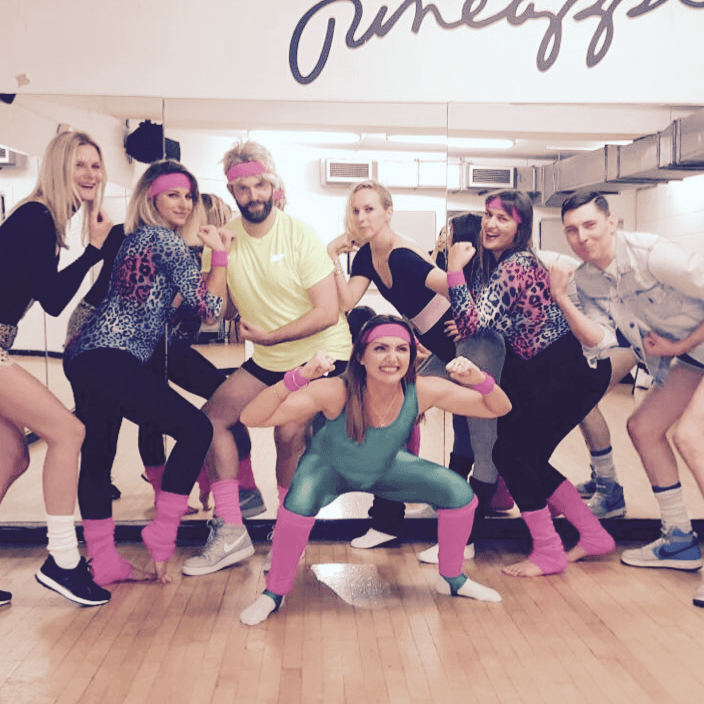 Our Musical Mash Up will give you a sample of a variation of styles, all whilst living that 80s dream! These were the movies that bought musicals back to the big screen. This mash up will prove to be electrifying, dirty and have you dancing like a maniac! GREASE is one of the biggest grossing movies of all time (tell us about it studs), it has groove it has feeling and so do we. 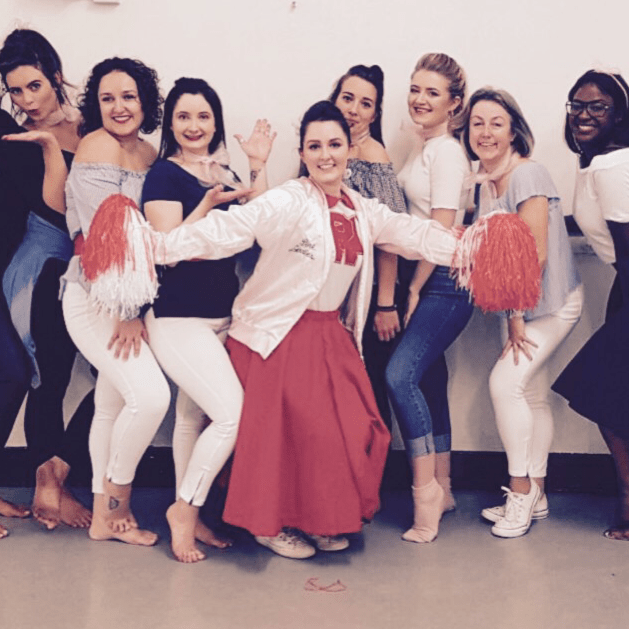 Your GREASE Dance Party Experience will feature iconic moves from y​our favourite Grease hits, “You’re The One That I Want”, “Grease Lighting” and “Hand Jive” – Get yourselves kitted in the Pink Lady or T-Bird uniform, you were born to hand-jive baby. Or maybe you’re too pure to be pink? 50s Rydell High looks are welcomed! Peachy keen, jellybean! The Wardrobe mistress also has a ​pink ​l​ady ​j​acket for the Hen to borrow who won’t go to bed till she’s legally wed! But there’s only one, so get it quick!​ ​Your Grease Dance Party Experience is sure to be ELECTRIFYIN’. If you opt for our Buff Butler and Bubbles Dance Party Experience. Danny Zuko himself will make an appearance. He’ll serve you Bubbles, maybe even flashing a bit of cheek. Then when his chills are multiplying, he’ll storm the dance studio and partner the head Pink Lady for a special dance duet​ moment. All of us had such a fab session and everyone is still talking about it. Michelle pitched the dance at a perfect, but still challenging, level for everyone and her teaching style was so friendly and approachable, putting us all at ease. Even the most nervous of us attempted the routine and felt comfortable letting our hair down and giving it a go with our ‘jazz hands’! 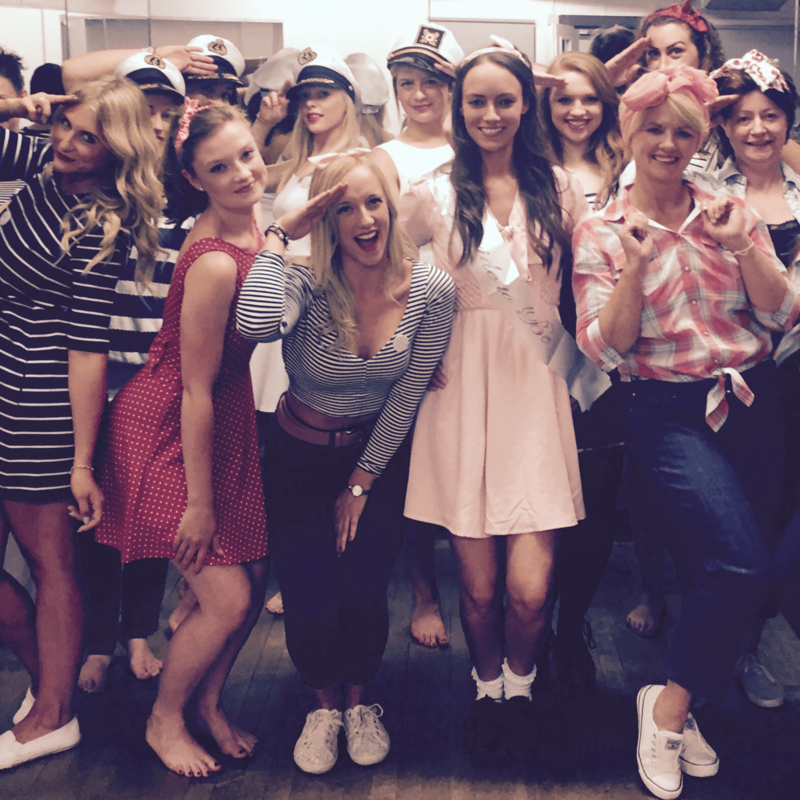 Check out our gorgeous 50’s Rydell gals! Treat yourself, upgrade to our exclusive London Male Instructor Dance Package!